Founded in 1970, Trails West, Inc. is a non-profit organization of emigrant trail enthusiasts who research, locate and mark emigrant trails, and then publish guides to interpret them. Join us in preserving the memory of the people who endured danger and hardship along these routes to establish a new life in the far west. Anyone with an interest in emigrant trails can join our organization. Our members range from trained historians to trail buffs. 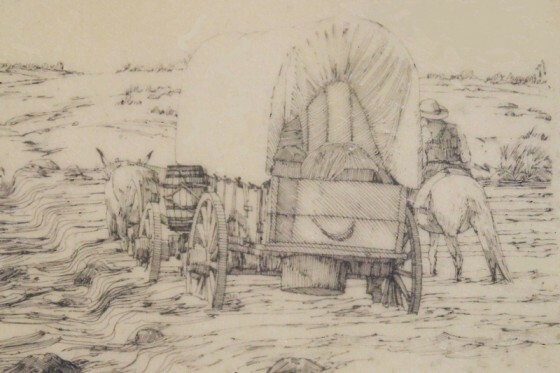 If you’re fascinated by the covered-wagon era, then this is the organization for you. Trails West has over 700 markers delineating over 2000 miles of emigrant trails stretching from southern Idaho and Utah, across Nevada, and into California and Oregon. We produce and sell driving guides to most of the trails the emigrants used to enter California and southern Oregon. These guides are popular with SUV drivers that want to see and experience the routes used in the mid 1800’s for our country’s westward expansion. These guides provide maps, turn by turn directions, and GPS coordinates to allow most modern SUV’s and trucks to follow these routes, both on and off pavement, through some of the most scenic country in Nevada and northern California. See our “Schedule of Activities” page for brief write-ups on recent work parties and last years completed trips. We are in the planning stages for this coming years field season. Be sure to check out our “Schedule of Activities” page to see our upcoming activities. Contact us and let us know if you’re interested in joining. Emigrant Trails West, Inc.. Proudly powered by WordPress. Valid XHTML, Valid CSS.